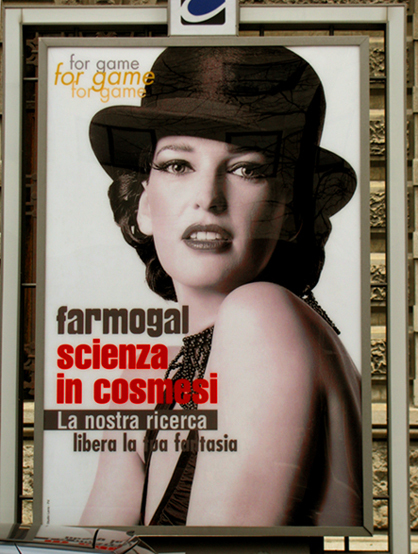 Farmogal Cosmetics & Studio Lavia Editoria e Comunicazione ⁞ Report Card: D ⁞ “For Game” is PR firm Studio Lavia’s brand-new publicity campaign for the Farmogal cosmetics company. Evidently, however, no one at Studio Lavia understands that “For Game” means precisely nothing in English. Just as clearly, they neglected to mention that fact to their client, which I can only imagine has paid quite a lot to have these confusing billboards placed on Italian sidewalks (this specimen comes from Padova, which is also the home of Studio Lavia). For the linguistic detective, it’s an interesting challenge to try to figure out what they thought they were saying. “Per gioco” exists in Italian; if that was the phrase, it ought to have been translated as “For Fun” or “Just for Fun” or something along those lines. But perhaps they were trying to say “Are You Game?” (though there’s no question mark). We’ve all seen the Chinese T-shirts with slogans like: “Happy Boy Extra Limb! 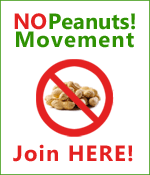 !” Perhaps that’s what they were after at Studio Lavia. (And perhaps I should open a new site called Italish.com.) In other words, meaning is an unnecessary detail. The important thing is to slap some words in English onto the sign. "I Sound Me" by SEAT: This Slogan Gibberishes Me! Sanpellegrino’s soft drink Chinò, meanwhile, is the sponsor of a promotion entitled “Gioca fuori dal coro” — in other words, “step out of the crowd,” “play your own kind of music,” pull away from the pack,” or words to that effect. The Italian site, however, informs visitors that Chinò is the “Sponsor Ufficiale di Play-Out.” Yeah so … “gioca” means “play” and “fuori” is “out.” But otherwise … huh? Sanpellegrino's "Gioca fuori dal coro"
Would it have been so difficult for Studio Lavia to consult with a native-English-speaking translator regarding its Farmogal slogan before plastering it all over fancy billboards? (Or SEAT? Or San Sanpellegrino? Or Cronotech?) My bet is that it would have taken about five minutes to come up with something better. Right. Except for those communication problems that come from not knowing how to write advertising slogans in English.